DEADLINE EXTENDED! We have extended the deadline for our staff positions, though for 2 different reasons. Read on to learn more! For our Co-Administrator position, we are extending the deadline because we have substantially changed the work schedule. Originally we were seeking help 6 hours/week, but now the position will be 24 hours/week. Our Co-Administrator helps oversee the day-to-day functioning of the school. Computer proficiency required. One part-time position available, approximately 24 hours per week, September-May. The new deadline for this position is April 17. Please get a cover letter and resume to us us if you are interested in these positions. For our teaching positions, we want to interview a minimum of 3 candidates for each position, so we have extended the deadline to hopefully get a few more applicants: two part-time Preschool teachers, one part-time Kindergarten teacher, one full-time Upper Elementary teacher (Grades 3-5) and one part-time Secondary teacher (Grades 6+). The new deadline for these teacher positions is May 1. Please get a cover letter and resume to us us if you are interested in these positions. See the flyer below for more information. Thanks! Salary - Staff are paid monthly; beginning July 1, 2019, the starting pay rate is $11.25, with an additional amount based on certification or degree ($.25 for A.A., $.50 for Bachelors, or $.75 for a Masters degree). Additional Benefits - Staff with students at the school also qualify for a generous tuition discount based on number of hours worked. Staff also receive nutritious lunches, paid holidays, and paid sick/personal days equivalent to 2 weeks of their regular schedule. Positions begin with staff meetings in June, July, and August, professional training days in late August, and a regular teaching schedule commencing in September. To apply, please submit a cover letter and resume. Please clearly indicate which position(s) you are applying for. 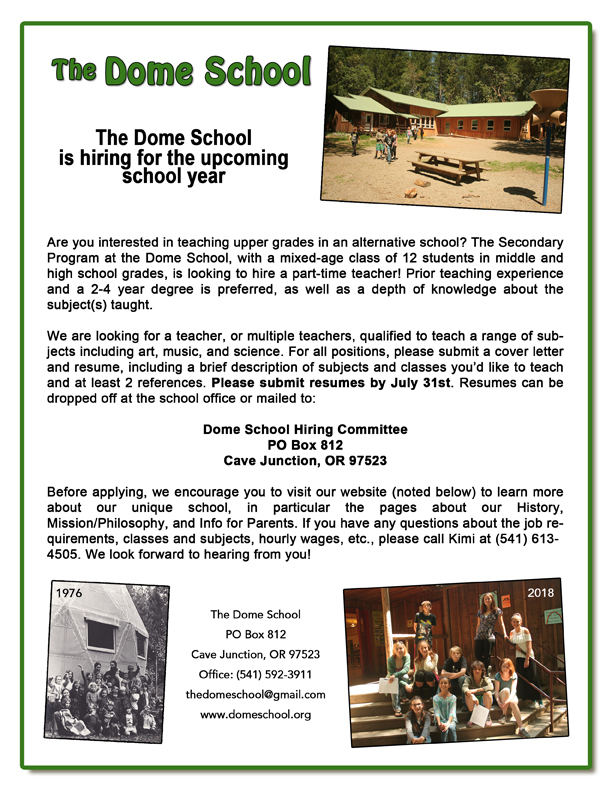 Applications can be dropped off at the school emailed to thedomeschool@gmail.com, or mailed to Dome School Hiring Committee, care of the address below. All applicants will be considered carefully. Those candidates selected for interviews will be notified shortly after the closing date. All applicants will be notified when the position is filled. NOTE WELL: Deadline to submit for Co-Administrator position is April 17 and for Teacher positions is May 1. For more information, please peruse the rest of our website (particularly our history, our mission/philosophy page and our info for parents). Feel free to call us with any questions. Our office number is 541-592-3911 and we’re here weekdays 9am-3pm. The Dome School has a non-discriminatory policy concerning gender, race, color, creed, religion, and national and ethnic origin. Please note: Any offer of employment made by the Dome School is contingent upon satisfactory results of a criminal background check. The evening kicks off at 4pm with an art exhibit and sale. Performances are scheduled for 6 – 9pm. We also feature a cafe atmosphere with quiche, salad, sweets, and drinks. Admission is on a sliding scale – $8-15. If you can pay a little more, please consider it, so that others who can’t afford it can come and pay a little less. Please note that there is delicate artwork and mature topics, so no young children. For our Co-Administrator position, we are extending the deadline because we have substantially changed the work schedule. Originally we were seeking help 6 hours/week, but now the position will be 24 hours/week. Our Co-Administrator helps oversee the day-to-day functioning of the school. Computer proficiency required. One part-time position available, approximately 24 hours per week, September-May. The new deadline for this position is April 17. Please get a cover letter and resume to us if you are interested in these positions. For our teaching positions, we want to interview a minimum of 3 candidates for each position, so we have extended the deadline to hopefully get a few more applicants: two part-time Preschool teachers, one part-time Kindergarten teacher, one full-time Upper Elementary teacher (Grades 3-5) and one part-time Secondary teacher (Grades 6+). The new deadline for these teacher positions is May 1. Please get a cover letter and resume to us if you are interested in these positions. See the flyer below for more information. Thanks! Our school is a strong parent cooperative and we are proud to support community-based learning and experiential education. Community members often work in myriad ways to support the school. Communication and community involvement skills are highly important components to these positions. Our Preschool and Kindergarten programs have a strong focus on social and emotional development and learning self-regulation through a play-based curriculum. Hours for the position are 8:30am-1:30pm, Tues & Thurs for Preschool, and/or 8am-3:30pm, Mon, Wed, & Fri for Kindergarten. Prior teaching experience preferred. Our Upper Elementary program (Grades 3-5) includes a thematic, emergent curriculum. We build our curriculum around different themes that stem from children’s interests. Arts, crafts, and other hands-on projects are always a large part of our curriculum. One full-time position available. Position hours are 8am-3:30pm, Monday through Friday. Prior teaching experience and a 2-4 year degree preferred. Our Secondary program (Grades 6+) features a holistic approach to academics. One part-time position available, with some flexibility of hours due to splitting class time with other teachers between 8am-3:30pm, Monday through Friday. Prior teaching experience and a 2-4 year degree preferred. Our Co-Administrator helps oversee the day-to-day functioning of the school. Computer proficiency required. One part-time position available, approximately 24 hours per week. Positions begin with staff meetings in June, July, and August, professional training days in late August, and a regular teaching schedule commencing in September. To apply, please submit a cover letter and resume. Please clearly indicate which position(s) you are applying for. 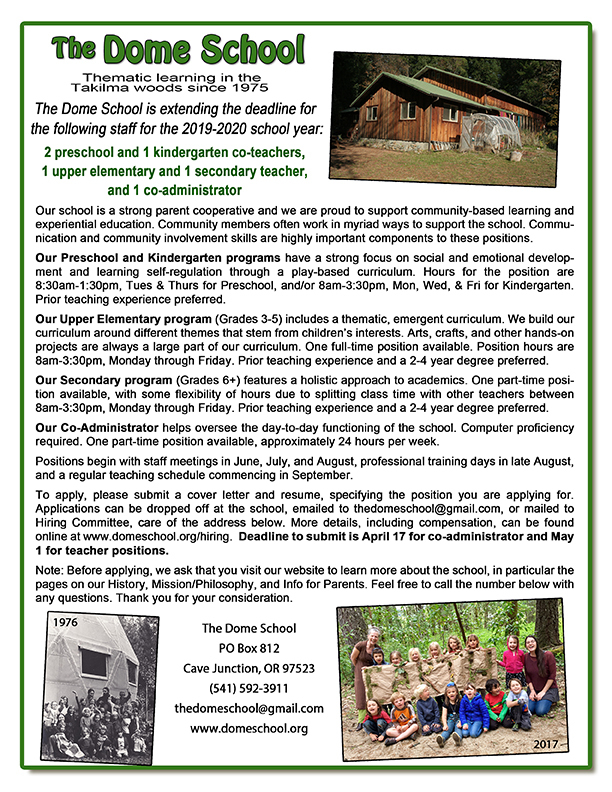 Applications can be dropped off at the school emailed to thedomeschool@gmail.com, or mailed to Dome School Hiring Committee, PO Box 812, Cave Junction, OR 97523. All applicants will be considered carefully. Those candidates selected for interviews will be notified shortly after the closing date. All applicants will be notified when the position is filled. Deadline to submit is May 1 for teacher positions and April 17 for the co-administrator position. For more information, please peruse the rest of our website (particularly our history, our mission/philosophy page and our info for parents). Feel free to call us with any questions. Our office number is 541-592-3911 and we’re here weekdays 9am-3pm. Yes, it’s the Dome School’s 36th (!) annual Winter Holiday Bazaar, happening Saturday, December 1 and Sunday, December 2, at your Takilma Community Building. Saturday hours are 10am-5pm. Sunday hours are 10am-4pm. Visitors can expect crafts, books, blown glass, herbals, farm products, jewelry, baked goods, note cards, dolls and dollhouses, sculptures, ceramics, knitted and crocheted goods, ornaments, wreaths, bird houses, wooden boxes and bowls, leather goods, pillows, purses, beeswax candles, and much more. The event features live music and raffle prizes. Breakfast and lunch and other food will be available too. And please don’t forget: this is a fundraiser for the Dome School. 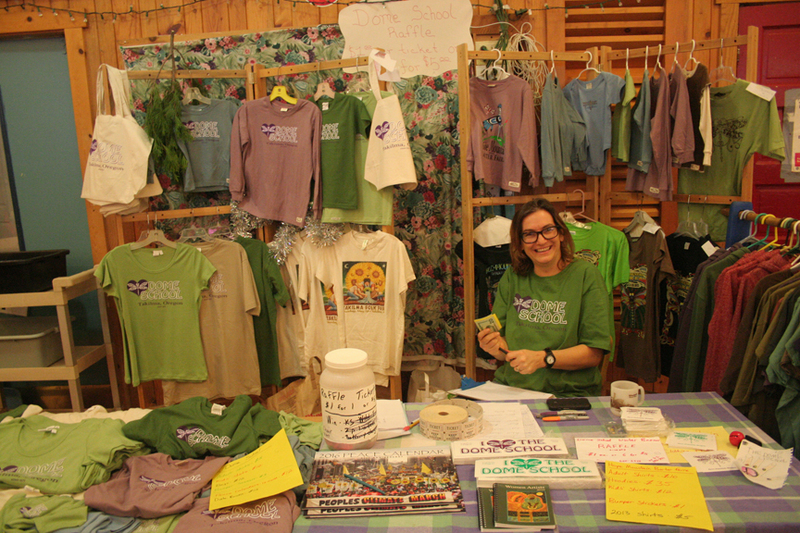 At our Dome School table, you’ll be able to find t-shirts, ball caps and beanies, bumper stickers, calendars from Syracuse Cultural Workers, and also Takilma Common Ground anthologies. Please consider supporting the school with your purchases. We’ll hope to see you all (t)here! First, we have a new website! Check it out at http://secondaryclass.weebly.com . We’ll hope to add new content at least every few weeks, so be sure to check back to learn more about the class. Second, we’re hiring! 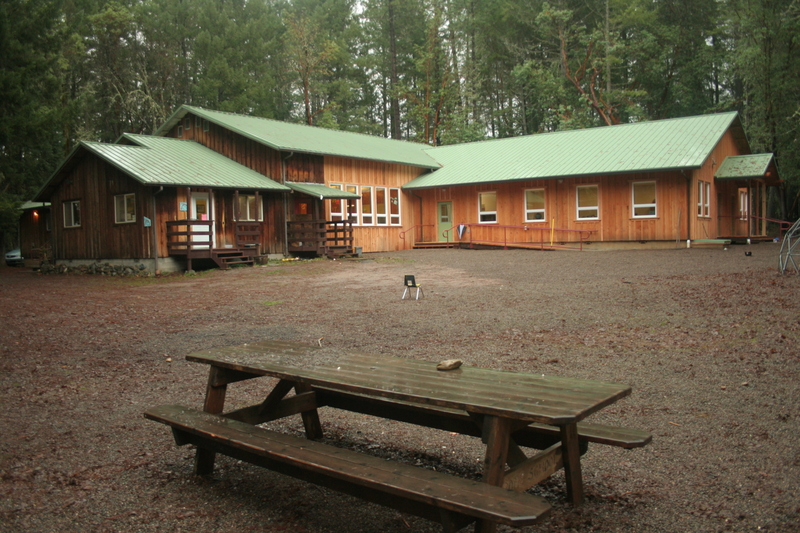 Yes, we’re looking for someone with an interest in alternative education and working with an amazing group of kids. Here’s the flyer with more information (below). Please let us know if you have any questions. Thanks! Well that was a grand time last night! Our grand re-opening of the Takilma Community Building was an amazing time had by all. 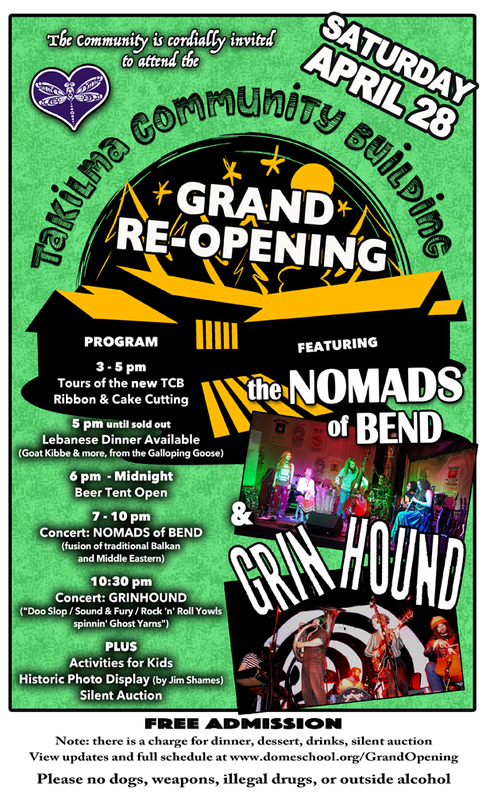 Two brilliant bands–the Nomads of Bend and the Illinois Valley’s own Grin Hound. Delicious Lebanese dinner courtesy Steph and the Galloping Goose. The cake from Nia and /’keIk/. Not to mention the amazing history all around the great room, with the photography of Dr. Jim Shames. New t-shirts with Dallion’s design. Silent Auction. Ribbon-cutting. Tours. And more! One thing we’d like to highlight here, however, is the announcement of our new monthly giving program. You can set up your bank or credit card to give a small monthly donation to public radio and the library and other places–why not the Dome School? The short version is this: head to donorbox.org/domeschool and you can pledge $5 or $10 or more to join all your much larger bills. The longer version can be found at our new “Support” page here on the website. The top of the page details the monthly program, but if you scroll down, you can find other ways to support the school–many that won’t cost you any additional money. Programs at Fred Meyer, Office Depot, and Amazon allow you to designate the Dome School to receive a small bonus each time you shop. And this doesn’t take away from any points you may earn for yourself! Please check out the SUPPORT page and consider supporting the school. Thanks! Please join us Saturday, April 28, to celebrate the grand re-opening of the NEW Takilma Community Building, featuring 2 new classrooms, a new library, and additional bathrooms. For music, we have confirmed two eclectic bands. 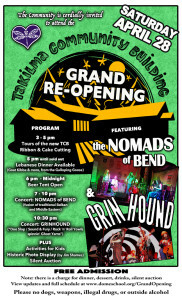 First, the Nomads of Bend! The Nomads provide a fusion of traditional Balkan and Middle Eastern music, and they are always ready for a party! You’ll definitely want to bring your dancing shoes. Second, playing into the wee hours, will be GRIN HOUND. Some words they use to describe themselves: ”Doo Slop / Sound & Fury / Rock ‘n’ Roll Yowls spinnin’ Ghost Yarns.” Yes, this will be a night of music the likes of which you maybe perhaps probably have never heard before. Dinner will be a treat too! The Galloping Goose presents a Middle Eastern meal, with three main dishes to choose from: Lebanese Chicken, Goat Kibbe (Lebanese meatloaf), or Falafel. Also, fresh flatbreads, an array of seasonal sides. $20 per whole meal, or a la cart build your own dinner. Trust us, it will be well worth it to arrive early for dinner, and the Galloping Goose will donate a portion of the proceeds to the TCB building expansion. And bonus: for dessert, we’ll have Kate Dwyer’s famous baklava as well! And did we mention a beer tent? Yes, it’s a special occasion, so why not offer the opportunity to enjoy a glass of wine or a cold beer in an adult-only space. But lest you think this is the typical party focused on the adults, we are planning a kids space too, with activities just for the young’ers. We’ll hope to see you all (t)here for the festivities, on Saturday, April 28. 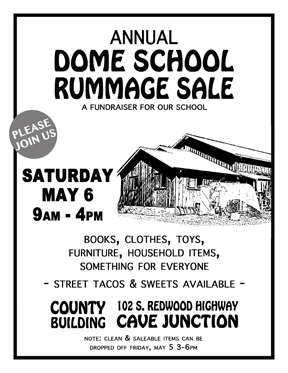 This very coming Saturday, May 6, we’re having a big Rummage Sale at the County Building in Cave Junction (102 S. Redwood Highway). Come on down from 9am-4pm, and find something new-to-you: clothes, books, toys, household items, furniture–something for everyone. We’ll also have street tacos and sweets for sale, so you won’t have to run away to score some sustenance while browsing the bevy of books or perusing the plethora of pots and pants. This is a fundraiser for our school programs, including our expansion of the Takilma Community Building. Please come out to support our school and community. Note: If you have clean gently-used items you’d like to donate to the rummage sale, please bring them to the county building on Friday, May 5, between 3 and 6pm. Thank you! We have reached a critical point in fundraising for the Takilma Community Building. We’re still approx $75,000 short of our goal. The good news is that we have a lead on a few large-ish donations we can maybe expect soon. But that still leaves a solid $50,000 or more, and if we don’t have it soon, the expansion will not be finished in time for the next school year. Worse, we will owe a penalty to the contractor. The community’s support is essential at this time. But we don’t want to keep asking for donations without giving something back. And so, we are launching our 30/50/70 campaign, with 30 ways for you to give and get something in return. ALL of these will benefit the community building expansion. (Click here to download the PDF with a handy checklist, or click here to learn more about the need for the expansion.) Thank you so much for your support!! 1. Rock out on Earth Day, Saturday, April 22. We’ll kick off our fundraising blitz at this great event. Free from 4-6pm, but when the headliners go on, your admission supports the TCB. 2. Take something home. At the aforementioned Earth Day event, we’re having a silent auction. Why not bid on a unique piece of art, a gift certificate, or more? NOTE: Items 1 and 2 raised more than $850 for the building expansion. Thank you–we’re on our way. 3. Get flower power. Why trek to GP when you can get bulbs delivered right to you and support the building expansion at the same time. Spring bulbs available until May 1, then Fall bulbs available. Order via the link at domeschool.org/bulbs NOTE: This fundraiser raised $347. Thank you! 4. Get a good price on something new-to-you. On Saturday, May 6, come out to our Rummage Sale at the County Building in Cave Junction, 9am-4pm. Clothes, books, toys, household items, and more. We’ll have street tacos and sweets for sale too. NOTE: The rummage sale was a success. Thanks to everyone who came and supported. We’ll update you soon on how much was raised. 5. Celebrate Mom. On Mother’s Day, Sunday, May 14, from 10am-2pm, Diggin’ Livin’ is offering a special Mother’s Day Brunch Menu. They’re donating 5% of Deli Sales to the expansion. Even if Mom is in another state and you just want to pick up a smoothie or a fresh baked pastry, stop in and support the TCB. (Thanks, Joy and Eric!) NOTE: A fine time had by all (how about them apple pie waffles?). More soon on this fundraiser. 7. Cover your head. Perhaps you’ve seen people sporting those cool ‘Takilma’ and ‘Dome School’ trucker caps (and how about the ones with just dragonflies!). Get yours at the Dome School office or Barter Faire. 11. Unload your bottles and cans. Bottle deposit are now 10 cents. Let us take them off your hands, and turn them into $ for the TCB. Through June. Drop off at school (near wood pile). 15. Smile! The Amazon Smile program gives an extra bonus while you shop Amazon. Start at smile.amazon.com and enter Dome School as your chosen charity. Similarly, you can connect your Fred Meyer card online, so we get a bonus when you shop (and these do not take away from your own rewards–it’s a bonus that you can support us!). 16. Reduce and Recycle. We’re collecting old printer cartridges, cell phones, tablets, and laptops, which we can turn into funding. Bring them by the school office anytime. 17. Honor a loved one. By having a room in our addition named in their honor. Gather friends and family and bundle your contributions together. 19. Enjoy Barter Faire. We’ll have a booth with assorted goodies. So come on out June 23-24-25 to help us celebrate the 15th Hope Mountain Barter Faire. 20. Rent the building. Want to rent the building sometime down the road? Pay ahead and get a discount. We get funds now when we need it; you save money on your rental down the road. Contact Jenn at 592-3911 to discuss. 21. Drink the Lemonade. This is not before our goal of June 30, but we know we’ll still need to be raising money through the summer. So head to Out N’ About for the Turning Moon Fest on August 4 and check out our planned smoothie and lemonade booth. Yes, that’s only 21 so far. We’ll be adding more over the next 2 months, so please check back periodically. Thank you! Get Flower Power and support the school! Here’s another way you can help us fundraise for our community building expansion. Through May 1, if you visit the Flower Power site and make a purchase, we will receive 50% back for every dollar you spend. Please use the link below. Great Schools.org - Read what people are saying abut the Dome School.